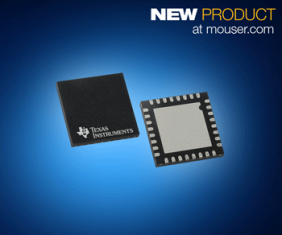 December 5, 2018 – Mouser Electronics, Inc., the industry’s leading New Product Introduction (NPI) distributor with the widest selection of semiconductors and electronic components, stocks the full line of gallium arsenide (GaN) modules from Texas Instruments (TI). TI’s GaN controllers, regulators, and drivers deliver reduced power with end-to-end power conversion and 5 MHz switching frequencies for high-performance applications such as electric motor design, augmented reality, LiDAR, and high-density industrial and commercial power supplies. The devices integrate high-speed gate drivers, electromagnetic interference (EMI) control, and over-temperature and overcurrent protection with an optimized layout to minimize parasitic inductance, maximize dv/dt immunity (CMTI), and reduce board space. The LMG1020 is a single, low-side driver designed for driving GaN FETs and logic-level MOSFETs in high-speed applications. The design simplicity of the LMG1020 enables extremely fast propagation delays of 2.5 ns and minimum pulse width of 1 ns. The LMG5200 80 V GaN half-bridge power stage provides an integrated power stage solution consisting of two 80 V GaN FETs driven by one high-frequency GaN FET driver in a half-bridge configuration. The LMG3410R070 600 V 70 mΩ GaN power stage boasts ultra-low input and output capacitance and supports higher currents, temperatures, voltages, and switching frequencies than silicon transistors, while reducing switching losses by up to 80 percent. Mouser also stocks a variety of evaluation modules for TI GaN products. The LMG1210EVM-012 evaluates the switching performance of the LMG1210 300 V half-bridge driver for GaN FETs. The small, easy-to-use power stage features an external PWM signal and can be configured as a buck converter, boost converter, or other converter topology using a half bridge. The LMG1020EVM-006 demonstrates nanosecond laser pulses for high-resolution LiDAR and time-of-flight (ToF) systems using an onboard LMG1020 low-side driver. The LMG5200 80 V GaN half-bridge power stage is supported by the LMG5200EVM-02 evaluation module. Engineers can use the LMG5200EVM to evaluate the performance of the LMG5200 as a hard-switched converter to sample measurements such as efficiency, switching speed and dv/dt. Also supporting the LMG5200 module, the BOOSTXL-3PHGANINV evaluation module offers a TI BoosterPack™-compatible interface to connect to a TI C2000™ MCU LaunchPad™ development kit. To learn more about TI GaN modules available from Mouser, visit www.mouser.com/ti-gan-modules.